I have had a few people ask me about this bourbon recently, so I thought I would review it on the site. Buffalo Trace is not necessarily the best known distillery to the general public, but in the world of domestic whiskey, Buffalo Trace may very well be the top dog. Year after year, at least a few of the whiskeys from Buffalo Trace are nominated for “Whiskey of the Year” awards, and they usually take home one or two. The distillery has been ranked “Distillery of the Year” by several different sources in the last five years or so. However, despite all of the brilliant whiskeys that Buffalo Trace puts out (George T. Stagg, Pappy Van Winkle, William Larue Weller, etc. ), the namesake bourbon of the distillery remains one of the best value bourbons available on the market today. 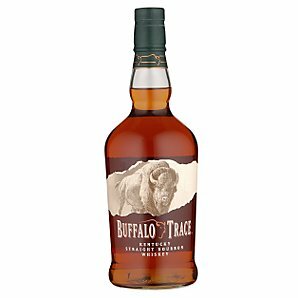 Buffalo Trace is a little more expensive than some of the other bourbons I have reviewed to this point, but it is usually under $30 for 750ml. It is also 90 proof, which makes it the strongest bourbon I have reviewed to this point. Don’t let the higher alcohol content fool you, though, Buffalo Trace is extremely drinkable, and it is a great bourbon if you are looking to expand your palate into the world of craft bourbon. The nose is subtle and complex, with the most prominent aroma being a corny sweetness. There are also strands of vanilla and caramel sweetness that weave through the nose, but this whiskey stands tallest when consumed. The palate in Buffalo Trace is wonderful and complex. The corn sweetness remains, but the vanilla comes through even stronger. There is some oak, some rye spiciness, and some robust toasted sugars that begin to shine towards the end of the palate. Buffalo Trace finishes with a seductive burst of vanilla and roasted caramel. This whiskey is a pure pleasure to drink from start to finish. My grade: B/B-. Price: $25-30/750ml. This is a very good whiskey, and one that is often in the cabinet.